We had to get moving after we relaxed in Sarakiniko... we still had quite a bit of ground to cover! We drove east along the coast with plans to go all the way to Pollonia. But we got a little distracted along the way a few times. We loved how easy it was to pull over pretty much anywhere in an ATV to take pictures. Totally worth the extra money for a rental to see so much more of the island! We continued on and finally reached Pollonia. It is one of the bigger villages on the island, so it has many restaurants, shops, accommodations, and is also home to one of the biggest beaches on the island. We arrived ready to eat some lunch, and we chose Gialos. Pollonia seemed like it would be a lively area, but there was only a few people eating at each restaurant and there weren't many people on the beach. Given all of this quite time in Milos, I am assuming we visited outside of the tourist season... which is crazy to me as it was mid-June! I'm not complaining at all - it was just interesting. After lunch, we hopped on the ATV's and did some off-roading. Luke got a little crazy with this, pulling right up to a drop off into the water, so he didn't have to get off to take pictures. In this next picture is the island of Kimolos. It is possible to visit these little islands by ferry, but we didn't have time. After Pollonia, we went to one of the more famous spots on the island - Papafragas. The sign was really difficult to see from the road, I think it was only visible from one direction, and it was in Greek. Good thing that our group was pretty knowledgeable with Greek letters! 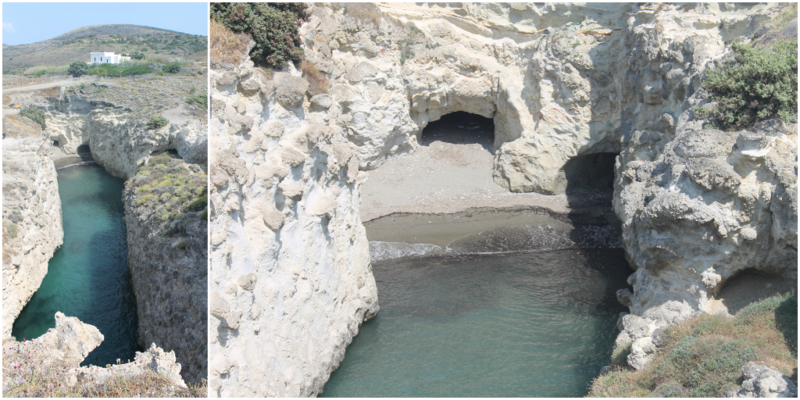 Anyway, Papafragas is an extremely unique rock formation that also has a beach when the tide is low. 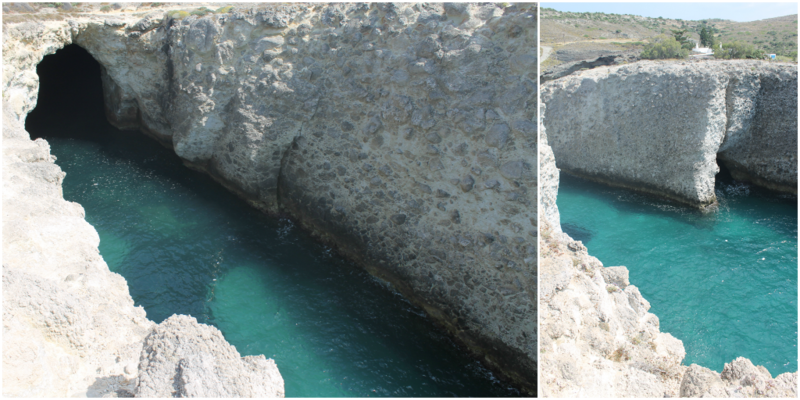 There are several caves in the rock, both at water level and up high in the rock, and also a few arches. Apparently Pirates used to hide out in the caves. Much of the area was roped off because it is quite dangerous to walk around - the ground was very uneven and any wrong step could send you over the edge. We disregarded the ropes and carefully walked around and entered a few caves. The beach here was accessible, but not recommended as the pathway going down was very worn. It was this next picture that Luke was standing in an area that made the rest of us VERY VERY uneasy. You can see us standing in the top right, and from where we were, it looked like at any moment he was either going to slip or the cliff was going break away. It was totally uncool! After enough exploring at Papafragas, we needed some actual beach time. We stopped at Mytakas which was quite big, and there was only one other set of people there. Becca and I laid out while Luke and Eric went on a photography spree. With enough relaxation for the time being, we moved on to Alogomandra Beach, which includes a small group of fishing homes. I just love these little homes! It seemed as if no one occupied them, so maybe I should just move on it! While taking pictures, here came these itty-bitty kitties slowly out of a hole. they.were.the.cutest! They had to have been just a few days old. They could barely walk, and I dont think they could see very well either. A few were very talkative, and some wouldn't even come out of the hole. There were about either total, and I wanted to put them all in my pocket! We were about finished exploring all we wanted along the coast, so we decided to head back to Adamas. But not with out some pictures stops. We decided to stop at the market for some hotel drinks and also stock up for our journey the next day. Look at this child with his child grocery cart full of alcohol! After a few drinks at the hotel, we were ready to make our way to dinner, but we decided to first drive south toward the airport since it was sunset. It was so calm along the water and the sky was pretty amazing even though the clouds covered up the sun! The boys dropped Becca and I off to get a table for dinner, while they returned the ATV's and walked back to the restaurant. This was my favorite meal of our whole trip! 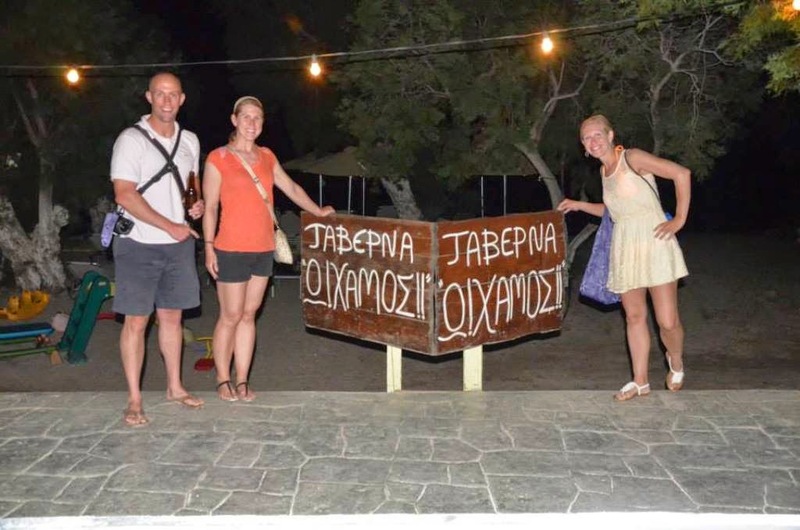 Several ways to spell it - O Hamos, O Xamos, or O Chamos and of course the Greek spelling. It is a small restaurant with only outdoor seating, which at first seemed a little fancier but it wasn't. Everything about this place was unique - a bag of goodies (with cutlery, napkins, bread, wet wipes, etc), handmade dishes, super kind and friendly service - it was amazing and I would go back to Milos just to eat here again! JUST KIDDING!!!! But wouldn't that be awesome!! So yeah this yacht is beautiful, but what I liked best was how it had lights underneath the boat so you could see everything in the water underneath it. It was so cool!! Well, we got back to the hotel, and Becca and I called it a night while Luke and Eric went down to the beach to have a few night caps. I know I have said it a bit too many times, but Milos totally made my Greece trip! Someday, we shall meet again! Beaches all throughout Europe have people who try to sell you stuff - watches, jewelry, scarves, dresses, tours, etc - but in Milos, there was not a single person doing this!